IBSAT 2019 Syllabus Pdf: Are you thinking to get admission in MBA institutes or colleges for MBA and PGDM programmes? You can apply for ICFAI Business School Aptitude Test (IBSAT 2019). After filling the form Prepare for it using the syllabus provided below. Latest Updates: Registration Form is out and ready to be filled; those who have not applied for IBSAT Exam yet can register until 12 December 2018. 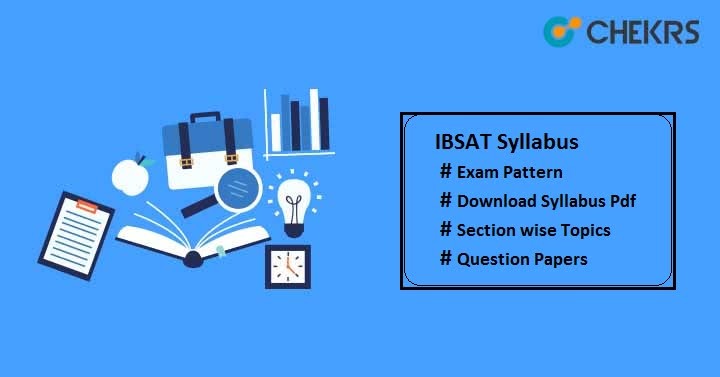 Candidates who are aiming to appear for this exam need to know the IBSAT Exam Syllabus along with Paper Pattern. The official has not prescribed any syllabus for exam but as per previous year’s question papers, the syllabus is almost similar to other management entrance exam syllabus. Here we have shared the Section wise topics for better understanding of IBS Entrance Exam Syllabus. Have a look over the topics mentioned below. To get merit marks in examination you should start exam preparation by following IBSAT Exam Pattern. It will guide you about examination mode, marking scheme, difficulty level of questions, questions type, section wise question distribution, language, time duration etc. No marks or zero marks will be awarded for each wrong & unanswered question. One more advantage in this exam is there will be no sectional cutoff & no sectional time bounding. After completing the exam syllabus and knowing paper pattern, you should give Online Mock Test to analyze your preparation. The university has provided facility of Mock Test on the official website. Just login to your credentials and start solving the questions. You can also check IBSAT Previous Year Papers to get a rough idea of original question papers. Practicing question papers will help you in improving your speed and accuracy and also in time management. You will get an idea on which area you need to more focus. We hope that details provided here are sufficient and useful for all viewers. You can ask your queries in the message box below. Keep in touch with this site to get the latest trends.